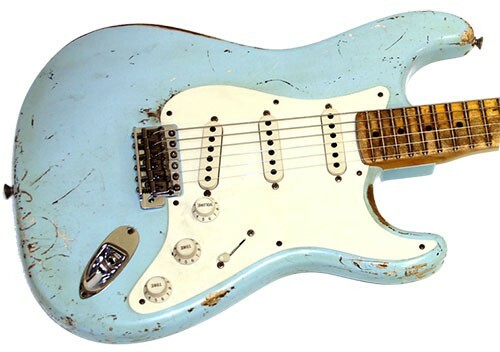 You can expect to get what many have described as THE BEST vintage Strat sound ever. Zero-Hum, longer sustain, minimized fret buzz and a nicely aged sound. This is the neck and middle pickup in the Traditional Mk-III set. The bridge pickup is the AVn-62 Mk-III. Scott Henderson (LA artist) talking about the sound of the 56 said "a year ago I would have thought this was impossible!" You will get classic, authentic lightly-aged Vintage sound with no noise & low string pull. The twangy low mids complement the richly textured sweet trebles that retain their cut even though noticeably less bright than non-aged sound. Mild break-up under heavy pick attack. Never harsh or brittle the sweet clear tone, commanding presence, detailed twangy low mids and dynamic response makes it versatile and ideal for Virtuoso, Rock, Blues & Country playing. The AVn-56 captures the essence and beauty of classic vintage Strat® sound, including the the bass response of genuine original vintage pickups. If sustain is your thing you will love the special low string-pull Alnico-K magnets that result in more sustain, less fret rattle & clutter and negligible 3rd & 6th string warble (Strat-itis); Kinman's advanced technology solves all the traditional, annoying irritations of single coil Strat® pickups. Experience the top-shelf vintage, no noise, no nonsense AVn-56 and discover 'How Sweet It Is'.